Eagles feature abundance of strong athletes. The Kennebec Valley Athletic Conference indoor track and field championships are still a few weeks away, and it can’t come any sooner for Messalonskee. On the girls side, the Eagles certainly have no problem going the distance. In a Dec. 31 meet at Bowdoin College, the Eagles had runners place in two out of the top three spots in the 800-meter, the mile and the two mile. Senior Avery Brennan finished second in the 800 (2:32.04) at the Bowdoin meet, and Holman said she has been a true leader to the team this season, providing help that isn’t found on a stat sheet. 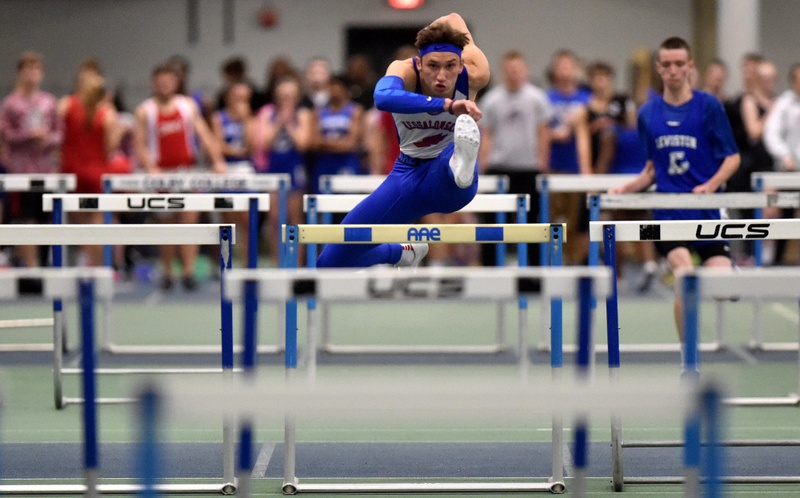 The eye-catching runner on the boys side as of now would have to be senior Tanner Burton, who runs the 55-meter hurdles. At the Bowdoin meet, Burton ran a blistering time of 7.78 seconds, topping second place finisher Hassan Mohamed of Lewiston by well over a second. Holman has also been impressed with mid-distance runner Zach Hoyle, who may be ready for KVACs now, as he’s consistently finished first each time he’s competed in the mile. Cam Bickford leads the team in throws, as he finished first in the shot put at the Bowdoin meet with a throw of 40-09.00. Lawrence coach Alberts enjoys a luxury many teams just don’t have: He has a plethora of athletes. One of many standouts on the girls indoor team is senior Kiana Letourneau, who is a newcomer to indoor track this season. Letourneau has been consistently strong in the 200-meter dash and the 400, but she is trying her hand in a variety of events. Her best output this season may have come during a Dec. 30 meet at Bowdoin College in Brunswick, when she finished first in the 200 (27.59 seconds), first in the 400 (1:02.44) and second in the long jump (15-5.00), finishing just short of Edward Little’s Lauren Berube (15-5.75). Alberts is pleased with the progress of his female runners, starting with senior Jaden Gray, who is steadily improving her time in the mile. Gray broke six minutes during the Bulldogs’ meet Dec. 30, finishing in 5:55.75, good enough for third behind Jillian Anderson (5:48.82) of Edward Little and Sydney Mccarren (5:53.84) of Morse. A nice addition to the squad has been former basketball player Olivia Patterson. Competing in her first meet on Dec. 30, Patterson provisionally qualified in the 200 (31.87 seconds) and the shot put (24-02.5). Alberts said he’s been pleasantly surprised by the progress of mid-distance runner Hannah Walsh, as well as Payton Goodwin, who qualified for states in the 400 with a time of 1:05.76 during the Dec. 30 meet, finishing fourth behind Letourneau, Mt. Ararat’s Katie Lynch and Brunswick’s Desiree Tanner. The Lawrence boys team — like the girls — are routinely finishing second or third at team meets. According to Alberts, one of the most improved members of the team is sophomore shot putter Alex Higgins. Last year, Higgins primarily threw under 40 feet. In the first meet of the season on Dec. 21 at Colby College in Waterville, Higgins had a throw of 43-10.00. Two other talented male athletes compete in the same event. Ben Copeland and Gunnar McAllister have finished either first or second in the pole vault in each of their three team meets so far this season, clearing 12 feet each time. It’s an especially impressive output for McAllister — a senior — who gave up track after eighth grade only to return to the sport this season. One of the best indoor track rivalries in the state may wind up coming from the same team. Sarah Cox and Jennasea Hubbard are both members of the Waterville girls team. Cox and Hubbard compete in the same event — the shot put. And both have been among the top athletes at Waterville’s meets. Cox has had an upper hand so far, finishing first at three meets. Her best effort came at Bowdoin College, when Cox had a throw of 33-05.00. The effort was a personal best, and is also the third-longest throw in Class B this season. Hubbard has been no slouch, either. She finished second (30-08.5) behind Cox at a Dec. 21 meet at Colby College. At the following meet on Dec. 27, Hubbard finished third with a throw of 29-00.0. It’s a young in-house rivalry, one that may grow within the next two years.